Business is about to pick up! The 2011 WWE Draft will take place tonight live on RAW. This year’s draft will go down as one of the most critical in WWE history. With declining business, descending ratings, and the early exit of a WWE megastar, changes couldn’t come faster in the WWE. There is no real way to predict this year’s WWE draft due to the format. It isn’t as if guys will be drafted like in professional sports by choice. Nope, instead draft picks will be determined “randomly” by a computer. So with that said let’s take a look at some moves that need to be made, moves that don’t need to be made, and a few possible shakeups we could see coming out of the draft. This big need this year is no secret. Edge has left SmackDown without an elite full time WWE superstar. Sure, there is The Undertaker but notice that I said the words “full time.” The Undertaker only wrestles sporadically throughout the year so he won’t do. Taking Edge off of the roster leaves an incredibly solid lineup of utility players with no real home run hitters. So who can go over to SmackDown and plug that sinking ship? The obvious choice here is Randy Orton. Let’s face it, there is John Cena, Randy Orton, and everyone else. As nice as it is to have Orton and Cena on the “A” show, it really doesn’t make sense under current circumstances. Not to mention, Orton has gotten incredibly stale on RAW as a babyface. There are fresh matchups from both the heel and face side that could really light Orton back up. Sure, he is an obvious choice but will he stay or will he go? I tend to believe he is going based on the last week of television. It appeared that Orton vs. Punk was going to be a drawn out program through SummerSlam. Having Orton beat Punk on television and then schedule a Last Man Standing Match at Extreme Rules leads me to believe that they have hit the fast forward button and are taking this one to the end due to Orton leaving. Although it certainly wouldn’t shock me to see Orton stay on RAW as last year the draft saw both Edge and Chris Jericho move to RAW leaving SmackDown in a similar situation as it is today. I also wouldn’t be shocked at all to see CM Punk move to SmackDown with or without Orton (similar to when Edge and Jericho moved together last year). Punk flourished on SmackDown the last time he was moved over to the brand. As popular as he is with his clique of Internet fans, Punk continues to get beat on television and in big matches. 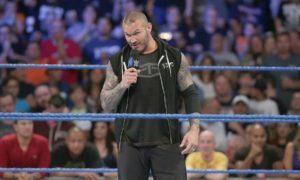 The damage has been done with the Orton feud and for whatever reason the WWE pulled the plug on his feud with John Cena in a matter of weeks. I do think if he goes over to SmackDown that he would probably wind up turning back into a babyface and be positioned in Edge‘s spot. Moving him over as a heel by himself won’t accomplish a whole lot. John Cena is always a name you have to talk about when you talk about the draft. Has Cena peaked on RAW? How important is Cena to the brand? I think these are all viable questions and the declining RAW ratings certainly support this debate. I think RAW would do just fine without Cena whereas I think SmackDown would get an immense boost. When all is said and done I don’t see it happening, specifically due to his feud with The Rock. Although I think there is an answer here with Cena which I don’t think the WWE would have the guts to do. With both rosters at their weakest point in years, I think it is time to unify the WWE and WWE world championships. Make one world champion like the tag team champions and have that WWE superstar bounce around to both brands. In the case of someone like Cena or even Orton, you get the chance to exploit their star power on SmackDown without weakening the RAW roster. The Miz is an interesting name to ponder. The Miz being WWE champion has no impact on whether he stays or goes since champions change brands all of the time in the draft. I have been banging the drum for a Miz babyface turn for a few weeks now and I think he’d have a heck of a shot in that spot on SmackDown. I don’t think Alberto Del Rio would be helped by a move, as a matter of a fact I think it would hurt. On SmackDown he could be champion and maybe ascend to the top babyface spot with a turn. On RAW he would probably lose three times to Cena over the summer and wind up stuck in a mid-card feud with Mark Henry. For his sake I hope he stays on SmackDown although I think he is a given to move to RAW. Rey Mysterio and Christian are probably the two top babyfaces on SmackDown right now. I don’t see either one of them moving. For Christian‘s sake, I sure hope he stays. Christian is finally getting the elusive main-event push in the WWE his fans have been screaming for. He won’t get that on RAW. Mysterio for some reason really struggled the last time he was on RAW. At this rate, I think the better quality opponents for him are on SmackDown although a Rey vs. Cena SummerSlam match could be incredibly intriguing. I am taking Triple H out of the equation this year. Triple H is a part time wrestler at best these days. Any move to SmackDown would have minimal impact since he was just there a couple of years ago. I think he sticks around and remains on the RAW brand. I would love to see Kofi Kingston stick around SmackDown and get an opportunity to compete for Edge’s spot. In my opinion, he is one of the most underutilized talents in the WWE. The same could be said for Daniel Bryan. Although in Bryan’s case I think he has a much chance to move to SmackDown and receive a bigger push than he would if he moved to RAW. Jack Swagger I think is a given to move to RAW. Swagger is exactly one of the main reasons less people care about the WWE drafts over the past couple of years. A guy like Swagger is supposed to be a SmackDown but regularly competes on RAW. Fans can see through that and have to wonder why anyone should care about the differences in brands when wrestlers from both sides appear randomly on the different brands. Considering the fact that Swagger is in a top feud on RAW these days, I think his move is predictable. As far as guys that could definitely use a new home I look at Wade Barrett on SmackDown and Sheamus on RAW. Barrett was a star on RAW before he was sent into the obscure world of SmackDown. He hasn’t clicked nearly the same on the blue brand as he did on the red team and a feud with Punk would definitely be intriguing. Sheamus has also struggled over the last year to gain ground on RAW. I think Sheamus has more potential than any of the younger guys to be a WWE megastar. Drafting Sheamus to SmackDown and feuding him with guys like Kofi and Rey would only enhance everyone. There isn’t a whole lot of shock value available in the draft anymore. There is so much parody anymore in the WWE that seeing one wrestler move from one brand to the other is nothing like it used to be. However, there is one move that is still in the deck that the WWE has never played in all of the years of drafts. That one move would be drafting The Undertaker to WWE RAW. Look, he isn’t a full-time wrestler anymore so taking him away from SmackDown shouldn’t be a big deal. Plus, at his age and in his current health the WWE may never have a chance to play this card again. Whether he shows up next Monday or three months from now, the mere thought of his presence on RAW would be enough to create some short term excitement in the brand. It isn’t a game changer, but it would be a fun move to see. If The Undertaker was ever going to go to RAW, this is the year to do it. On top of that, having The Undertaker on RAW would give the Triple H vs. Undertaker rivalry a whole new dynamic. I wouldn’t expect them to wrestle right away, but you could tease the feud over the next few months without ever having them touch until WrestleMania 28. There is also that John Cena vs. The Undertaker match that the WWE has never fully exploited as well. So there it is in a nutshell. Again, there aren’t any real game changers other than Cena going to SmackDown but that is what you get with the 2011 edition of the WWE. Check back later tonight for 2011 WWE draft results and a full recap here on the Camel Clutch Blog.